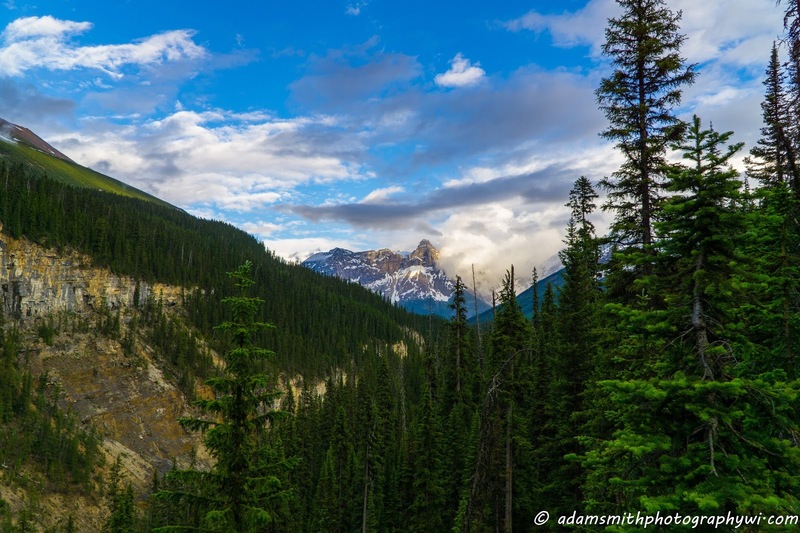 With all of the hype that Banff and Jasper get (deservedly so too) Yoho National Park often gets overlooked or left out altogether from traveler's itineraries. The park is so close to Banff (only about a half hour from Lake Louise) that it is very easy to fit in for a half day if you've got a vehicle at your disposal. 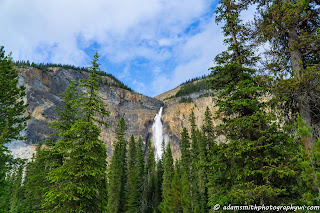 Some of the highlights that I was able to see are in the sections below, but I also recommend trying to get to the remote Lake O'Hara - more on that soon. Yoho is a place that would definitely fit in my Most Photogenic Places on Earth series...but then again, so would almost every square mile of the Canadian Rockies. Check out some of my highlights, tips and recommendations below and, as always, drop me a comment with any questions or ideas of your own to add. Much easier to get to, the Yoho Valley Road is a beautiful drive through mountain forest with a number of spots worth pulling off and snapping a few pictures. The road typically opens in late June after the snow melts and will stay open until it starts to snow again a few months later. There's a steep section at the beginning with a series of switchbacks that is a blast to drive on! You would absolutely not make it up the switchbacks with any amount of snow covering the road. After a few kilometers of scenic driving you'll arrive at Takakkaw Falls - a strikingly beautiful fall that drops nearly 1,000 feet. It's signed very well from the road so you can't miss it. 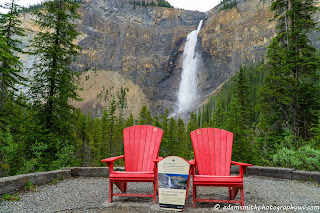 You can park nearish to the falls, stop at the iconic red chairs with a view of the falls, hike across a bridge and then scurry up some rocks to the very base of the falls if you so choose. There's just something amazing about standing that close to a huge waterfall. The fall is at it's biggest and most powerful during the summer meltdown and shrinks to a small strand of water in the late fall/winter. 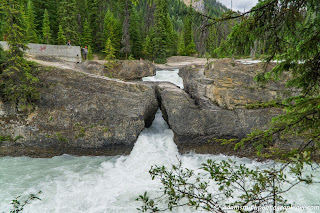 About a half hour from the Yoho Valley Road is another road leading to a couple of Yoho's signature sights - the Natural Bridge and Emerald Lake. Neither of these take much effort to see as you can park just a few paces away. 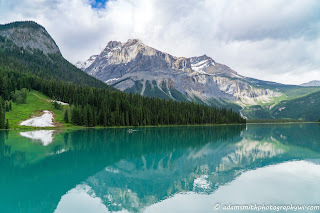 Emerald Lake is probably one of the most underrated lakes in the region, with more well known spots like Lake Louise or Moraine Lake getting most of the attention over in Banff National Park. Emerald Lake, however, is quiet and has a serene beauty without the tour buses full of people constantly streaming in and out. 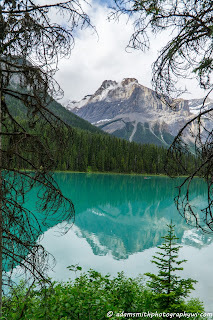 It's called Emerald Lake for a reason, the color is absolutely astounding and with a number of mountains surrounding the lake, it is a photographer's dream spot. The glacial runoff full of ground up rocks is what causes this color in various shades in almost every river, stream and lake in the area. Bring a snack and just chill by the calm water for a while before heading on to your next stop. The Natural Bridge is a neat spot to walk around and only about ten minutes away on the same road you came in on. Here you see first hand and up close the incredible power that water has whittling down rock over thousands of years and, of course, snap a few photos. Now, back to the aforementioned Lake O'Hara . This lake, which many claim to be one of the most beautiful in the region - quite an accolade to have considering some of its neighbors - is only reachable by bus or or through walking up an 11km service road. There is absolutely no vehicular traffic allowed outside of the park's shuttle bus. The bus only runs a handful of times each day during the peak season to limit the amount of people in Lake O'Hara's fragile environment. I tried to get tickets, but the entire year booked up in literally minutes when the sale went live online. Apparently, you can show up and wait in line to see if some people cancel, otherwise you're simply out of luck unless you have the time to hike the 11km (6ish mile) road to the lake. There are some world class hikes starting around the lake which would definitely be worth adding a day to your trip if you can manage to get there! Nearby is the town of Field, a small settlement built around the railway which has some cute houses and a number of cafes and restaurants. If you've got the time (or need a bite to eat) it'd be worth passing through as it is only a few minutes out out from Yoho's best attractions. You can also take a guided trip to the Burgess Shale fossil beds if you've got some more time. One can also check out the engineering marvel of the Spiral Tunnels from one of the easily accessible viewpoints, or a little further out visit the smaller but powerful Wapta Falls. Yoho has some amazing sights without the crowds of other spots nearby in Banff or Jasper. It's easy to hit these highlights in an afternoon if you've got your own transportation and they should not be missed on your Canadian adventure. 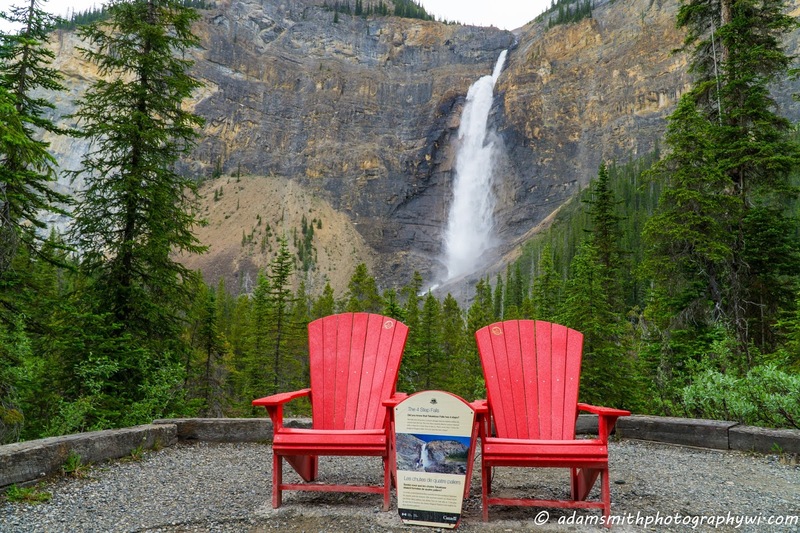 Remember, there is still time to visit all of Canada's national parks for free this year with the Discovery Pass!